You need to find an apartment as quickly as possible. So you begin your search and rush through the process. It sounds like a recipe for disaster, right? The fact is that your decision relies on a number of factors, both financial and personal. Should you choose to cut corners, you could wind up paying thousands of dollars on a less-than-ideal unit. 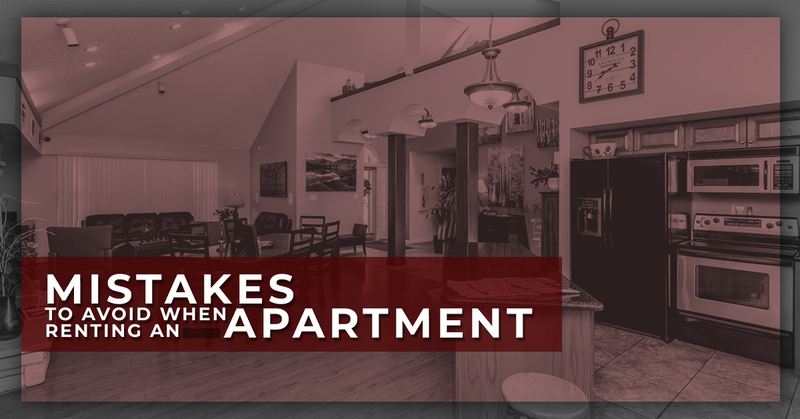 Keep reading as we explain the common mistakes to avoid when renting an apartment. Skimming the lease – Let’s say that you found an incredible apartment. Obviously, you’re excited and can’t wait for the move-in date. But don’t think you can just glaze over the lease details and be done with it. Read closely to see when rent is due and procedures for when you move out at the end of your lease. It goes without saying to address any issues with your lease before signing it. Don’t forget that this is a legally binding document. Passing on renters insurance – You’ve been pinching pennies for years. Maybe you’re still on a tight budget and can’t afford many extra expenses at the moment. Frankly, it’s easy to overlook renters insurance. But what happens if you come back to a fire that destroyed your belongings, including high-priced items such as electronics? If you’re planning to get an apartment of your own, don’t overlook renters insurance. Renting without seeing the apartment – You would be surprised at how many people sign an apartment lease without actually seeing the unit, or at least one that’s similar. Granted, scrolling through pictures online helps, but remember to see the real thing. Who knows? It could be that your unit wreaks of a nasty odor left by the previous resident. Failing to take amenities into account – If you really want your apartment to feel like home, then the unit should contain more than a bedroom, bathroom, and kitchen. Take the amenities at Gateway Place Apartments, for example. Residents can enjoy cozy wood-burning fireplaces, vaulted ceilings and skylights, walk-in closets, heating and air conditioning, as well as private balconies. Then there are the community features. We put resident comfort and satisfaction at the top of our priority list, which is why our complex has a state-of-the-art fitness center, tanning bed, swimming pool, hot tub, cedar sauna, picnic areas, and plenty of open space for just hanging out. Not only that, but we are on the short list of Greeley apartments that allow pets. Feel free to take Fido to our extra large dog park once you’re settled in! Choosing the cheapest apartment you can find – This ties back to the second point. You’re always looking to save money. Naturally, it would make sense to opt for the cheapest apartment in town, right? Not exactly. The last thing you want is to be sharing your unit with cockroaches and putting in maintenance requests every day for broken-down appliances. 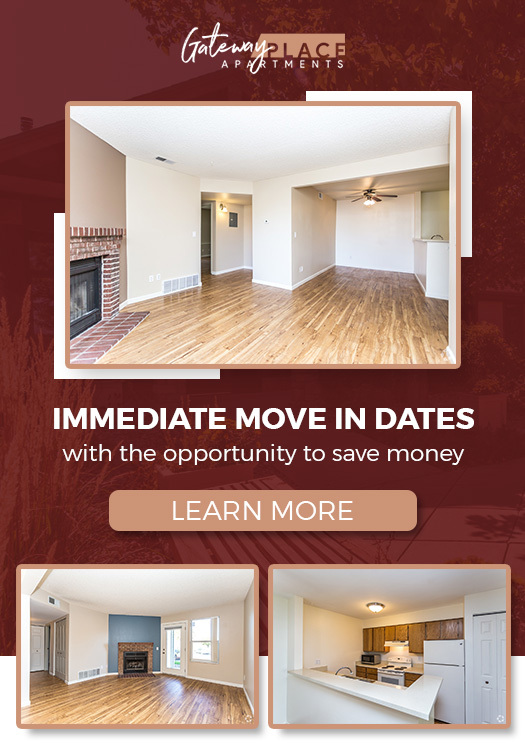 Are you considering apartment living in Greeley? We recommend stopping by Gateway Place Apartments for a tour. Whether you have a one-bedroom unit in mind or need a two-bedroom, two-bathroom space for the entire family, we have you covered. The Gateway Place complex is steps from bus routes and local parks/trails. Plus, we are situated near the city’s prime shopping centers and restaurants. Interested in taking the occasional day or weekend trip to Rocky Mountain National Park? You will appreciate the easy access to Highway 34. Gateway Place is Greeley’s choice for pet-friendly apartments. Don’t forget to ask about garage apartments for rent, either! Contact us today to schedule an appointment.